Alemlube has been proactive in marketing a diverse range of sought after hose reels to the mining industry for over forty years. The necessities and requirements of the industry have always been the utmost, top of mind consideration when Alemlube researches, sources, field tests and then confidently makes high quality and reliable hose reels available to the industry. Renowned for strength and dependability, Alemlube’s reels are some of the best in the game from around the world and are backed by uncompromising warranties and supported by efficient after sales service when needed. Two innovative and compact reels have just bolstered the Alemlube offer and are already proving to be real winners. 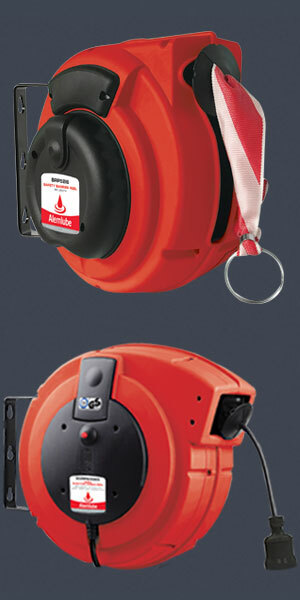 The new BRP5216 Safety Barrier Reel is an innovative storage & retrieval system containing 16 metres of red/white safety band designed to provide a temporary visual barrier to clearly identify hazardous or dangerous areas in the workplace, specifically mining workshop operations, around public areas and on site The durable, long lasting red/white safety band is complete with a circular hook/eyelet that easily attaches to any suitable fixing point up to 16 metres from the reel. The robust plastic outer casing contains an automatic spring rewind mechanism that efficiently rewinds the safety band for storage after use and the reel can be mounted/demounted via the integral swivelling steel mounting bracket. Always good, if not essential to have on hand, the BRP5216 Safety Barrier Reel available from Alemlube is a must for addressing workplace and employee safety. And then, the new ECRP24025 240V Electric Cable Reel is also a desirable addition to mandatory mining workshop equipment and contains 25 metres of 3 x 1.5mm2 wires – 9amp cable and plugs designed to provide a convenient, tidy and safe means of controlling electric cable in the workplace. The robust plastic outer casing contains an automatic spring rewind mechanism that efficiently rewinds the 25m cable for storage after use and the reel can be mounted/demounted via the integral swivelling steel mounting bracket. Always beneficial to have on hand and also a must for addressing workplace and employee safety, the ECRP24025 240V electric cable reel available from Alemlube is a user friendly, compact designed reel complete with thermal overload protection that activates at close to 56ºC. The user must fully extend the electric cable prior to switching on mains power to avoid the cable over heating. With maximum power ratings of 800W when coiled and 2000W when uncoiled, the ECRP24025 240V electric cable reel is CE approved and Australian Standard compliant in accordance with AS/N25 3000 standard. The convenience of Alemlube’s compact Safety Barrier Reel and 240V Electric Cable Reel will quickly be realised and will greatly assist in your day to day employee safety considerations. Don’t forget that Alemlube can assist you with all your hose reel equipment needs. The full range includes grease, diesel, petrol, oil, air, oxy-acetylene, water, waste oil, waste water and stainless steel hose reels, with a mix of spring, power and hand rewind mechanisms.